January is National Soup Month, and to celebrate; it’s time to change the way we think of soup! It’s no longer just a starter or a side-dish; it can be a complete meal! Having soup as a main opens up a world of possibilities, and because most soups can be prepared ahead of time; it takes some of the pressure off of crazy hour (what I like to call the insane hour between 4pm and 5pm when kids become crazy people and you’re trying to get dinner on the table). What makes soup a complete meal you ask? Add a healthy carb like pumpkin, squash or sweet potato to the broth. This is simply done by adding canned pumpkin puree or diced squash, sweet potato or carrot right into the broth. If you’re adding diced vegetables, use a hand-held emulsion blender (I use this one by Cuisine Art); to puree it once cooked. Toss in some protein! I usually dislike cooking meat because it’s an extra step required in preparing my meal. That being said, adding chicken, shrimp, pork or lentils & brown rice (remember the combo of legumes + whole grains = a complete protein) is easy with soup – just toss it in and let everything cook in the same pot! Cooking meat in a liquid also means you won’t overcook it or dry it out. Top with a healthy fat garnish like diced avocado, dried coconut, almond slices, walnut bits pumpkin, hemp or sunflower seeds. Healthy fats are important to include at each meal to keep you feeling satisfied and for good overall health. Plus, it adds another flavour and texture to your soup, making it more like a main dish. Flavour with fresh herbs. Just like you would a main meal, top your soup with fresh cilantro, parsley or basil to add flavour, colour and more health benefits. Did you know parsley is one of the best food sources of vitamin C? Using a large soup pot, heat curry paste, garlic and ginger on medium and saute for 1 minute or until fragrant. Add pumpkin puree and chicken stock. Turn heat up to medium high, stir and cook for 3 minutes until bubbling. Add chicken and coconut milk and cook for 3 minutes. Add sugar, hot sauce, fish sauce, salt, cinnamon and lime. Stir to combine. Let simmer on low for about 15-20 minutes. 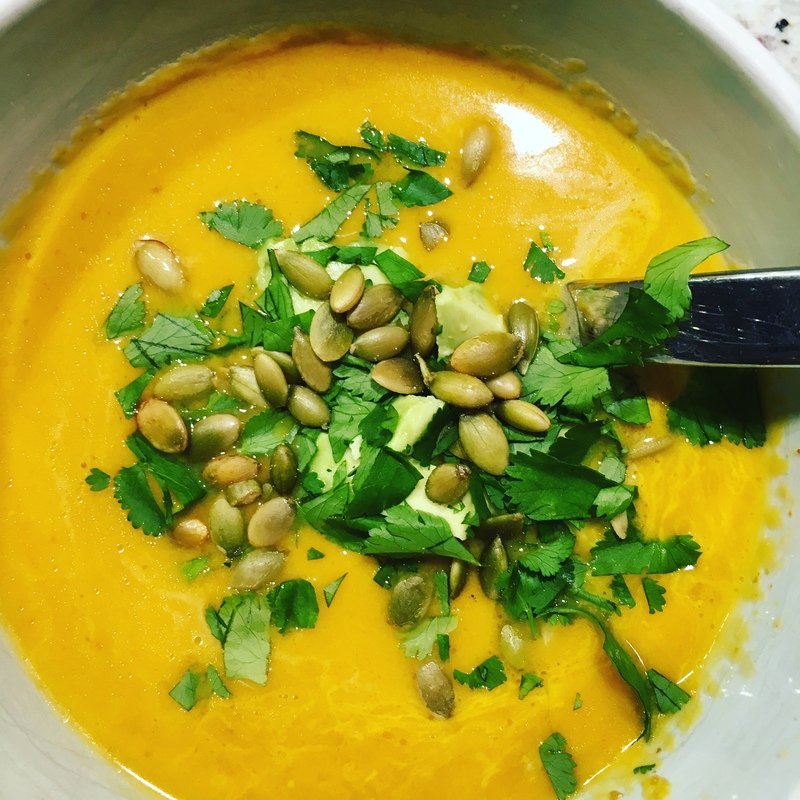 Serve into bowls and top with diced avocado, pumpkin seeds and fresh cilantro. Enjoy!